Using them on the floors at the "crime scene" of a murder-mystery party. Placing them on the shower curtains for a Psycho movie marathon. On the mirrors just for fun, to scare someone. Any Halloween-related gathering or event, of course! 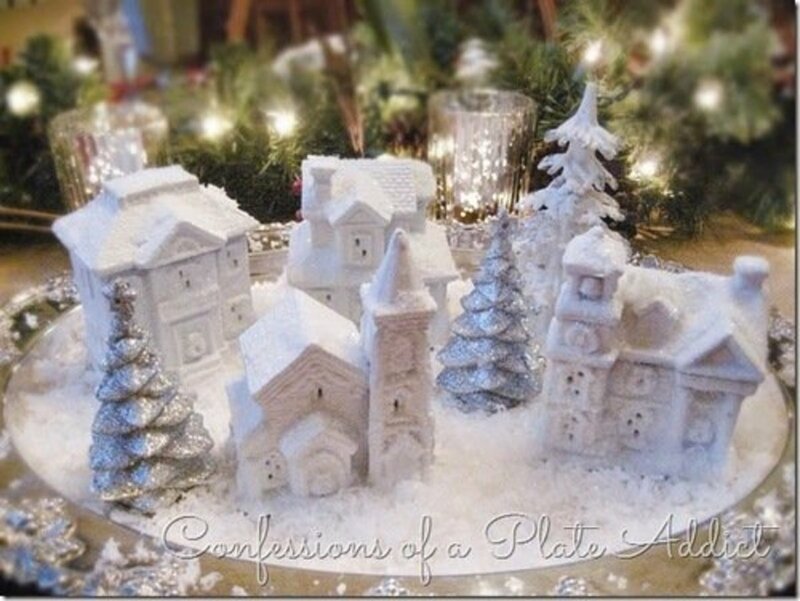 A lot of people just buy premade decorations with a gory theme and put them up. For me, that takes a lot of the fun out of decorating my home. That's why I thought it would be fun to create a budget-friendly craft project that produces unique looking bloody handprint window cling decorations and fake blood drops. 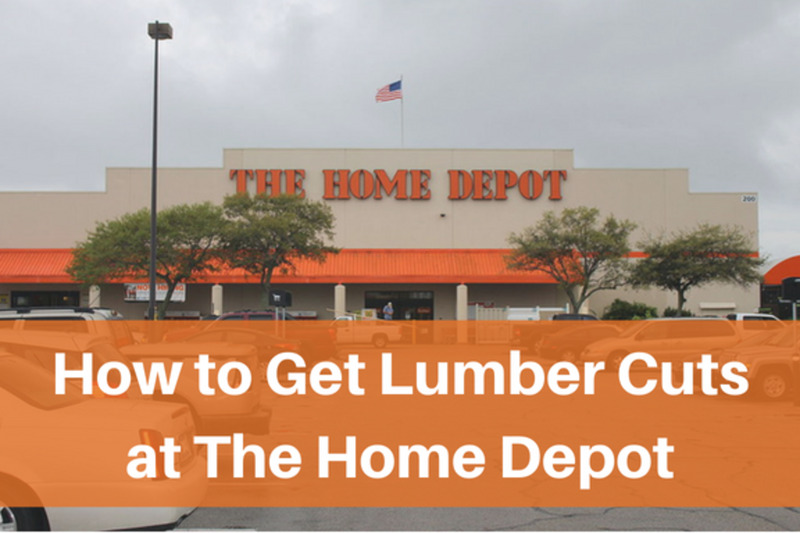 This article will lay out all the steps you need — have fun! While you'll probably find the food coloring at a grocery store, the craft glue, plastic wrap, and wax paper are also often available at dollar stores. A note on the gloves: If you do this craft project without gloves, you will stain your hands with red food dye. However, bare hands are the easiest to work with and the gloves may make for a somewhat messier finished project and work area. I personally prefer to use my bare hands — it gives me more control and the dye goes away after about a day. If you use a hand lotion to moisturize your hands before you start the project, the dye will come off easier. Before you start mixing up the fake blood and start making the clings, you'll need to prepare your work area. This is important, as this can be a messy project — especially if you get children involved (and, you should! As long as you use non-toxic glue, this can be fun and perfectly safe for kids). Prepare your work area on a washable surface, preferably in a room with a smooth, washable floor. Wrap the plastic wrap carefully around the cutting board, clipboard, or the piece of foam core board very carefully so that surface is completely smooth. This is actually the hardest task involved in the whole project. Secure the plastic wrap with tape on the back side of whatever board you are using. I used a square piece of countertop material that I use to make crafts on. No matter what you use to keep the plastic wrap in place, be sure that it holds it securely. I'd also suggest wearing a smock to cover up with or wearing old clothes you don't mind staining for both the adults and children taking part in this project. Pour about an ounce of craft glue into a small bowl or cup and add a single small drop of blue food coloring to it. Stir the blue food coloring in well and, while doing so, add the red food coloring one drop at a time. Stir thoroughly between drops, until the mixture reaches a shade just lighter than you want the finished product to be. The mixture will become darker and more translucent when it dries. If you get it too dark, that's OK — it will probably be more realistic because the real stuff is much darker than most commercially available fake blood and movie blood. I recommend making just an ounce of the glue mixture to start. This allows you to tweak and adjust the color to your preferences. Once you get the hang of coloring the glue to bloody perfection, you can mix it directly in the glue bottle to reduce the mess and make for easier application. This step will provide a base for each print. You will get your hand covered in craft glue, so if that is a problem, you will want to wear the latex or non-latex surgical glove here. Coat your hand in craft glue, as pictured above. Press it down on the plastic wrap, leaving a white craft glue hand print on it. This is where you'll see why it was so important to secure that plastic wrap! Repeat the pressing as many times as you can easily fit on your stretched-smooth plastic wrap. Fill in the shape of the hand in each print with more craft glue to a thickness of about an eighth of an inch. Also, make sure that you wash your hands, and the glove if you used one, in warm soapy water. This step will provide a base for each print. You will stain your hand with red dye during this step, so if this is a problem, wear a latex or non-latex surgical glove. Holding your hand over the plastic wrap, use the back of a spoon to paint a thick layer of your fake blood glue mixture onto it. It doesn't need to be perfect — just make sure it is about an eighth of an inch thick everywhere but the center of your palm. Then, flip your hand over and press it onto the dried plain craft glue print and pick your hand back up. Keep painting your hand with the bloody mixture and pressing it into the bases until you have as many bloody handprints as you'd like. 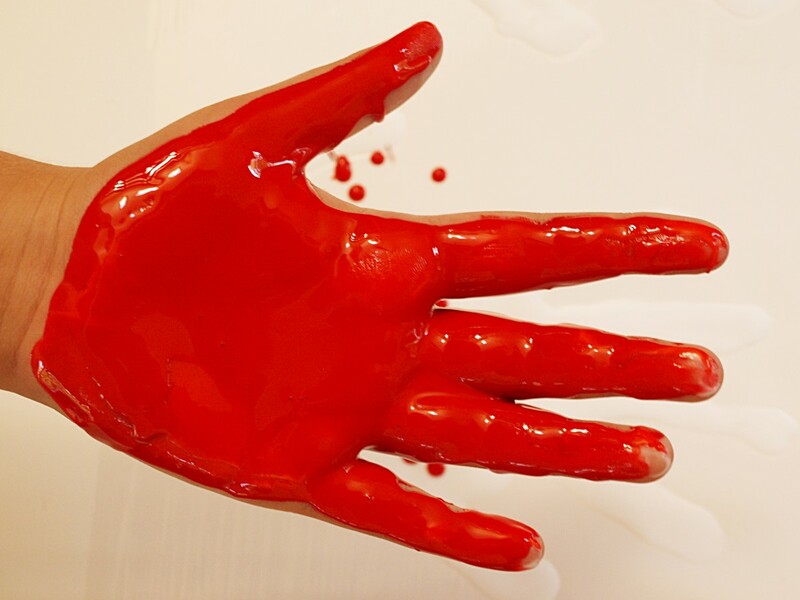 Now, after washing off your hands (or glove) with warm soapy water, use a spoon to carefully pour and spread more fake blood glue onto the handprints to ensure that they are all about an eighth of an inch thick. 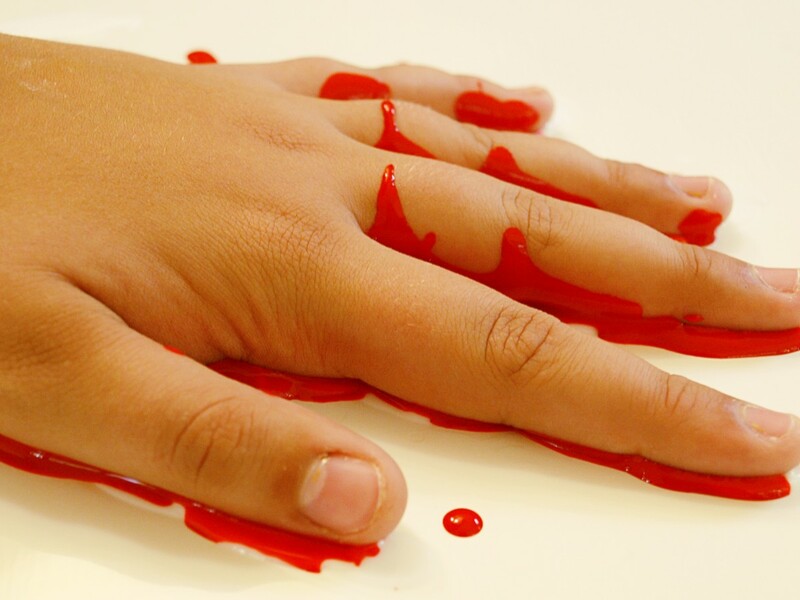 Allow the glue to dry until it becomes translucent before you carefully peel the plastic wrap off of the blood drops and bloody hand print cling films and store them between sheets of wax paper, unless you intend to use them immediately. If you didn't make the glue mixture thick enough to peel off in a nice, substantial cling film you can add more layers of it and allow them to dry again. Also, there will likely be drops of blood glue on the plastic wrap just from what you spill or drip accidentally. 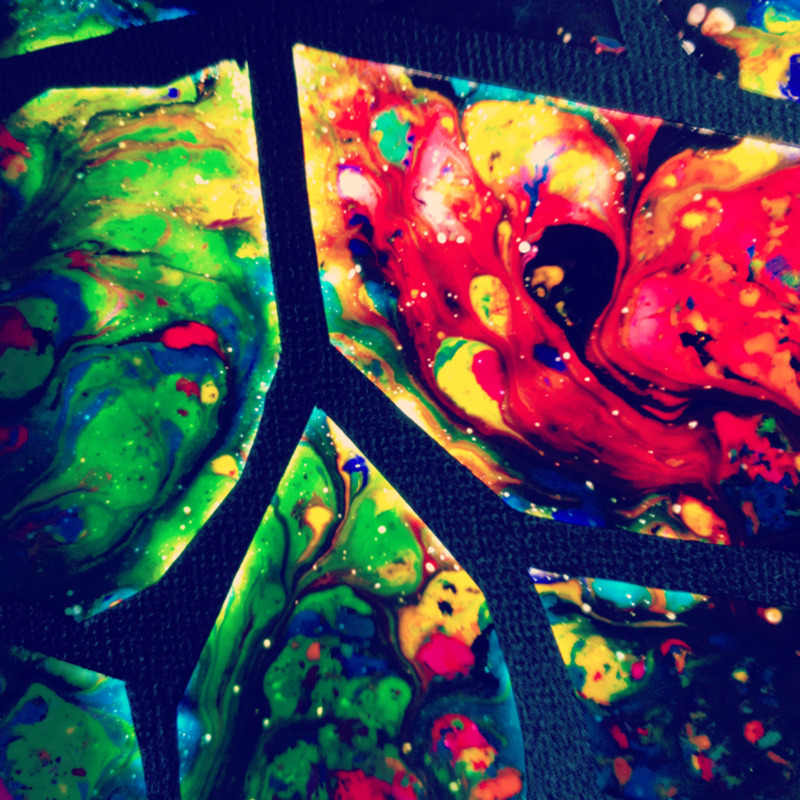 If you prefer more, just drop more colored glue in shapes you like an eighth of an inch thick on the plastic wrap. Pressing your bloody hand into the plain glue bases to around an eight of an inch thick. Press your bloody hand into the bases and then drop whatever remaining glue is left to create blood drops. You can stick your bloody creations on smooth washable surfaces including: windows, mirrors, shower curtain liners, and linoleum. DIY bloody handprint window cling on a shower door. Too Much Work? Too Much Mess? If you decide to cheat on this craft project and buy a pack of these, I won't tell a soul! One of the requirements was wax paper, but it was never used in the instructions. 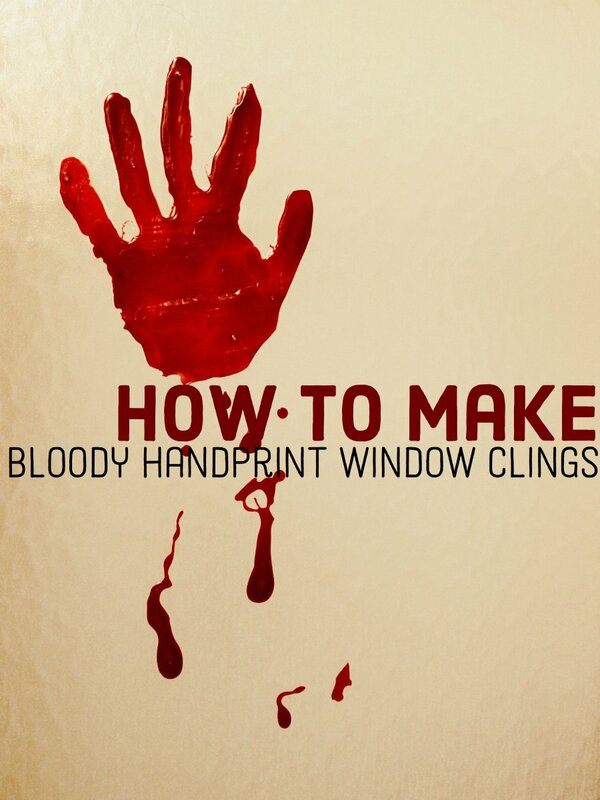 Where does the wax paper come in to play in making DiY bloody handprint window clings? The waxed paper is used to store the clings before and between uses. If two or more clings touch each other too long without waxed paper in between they bond together. How can you turn these bloody handprint window clings into a gel cling? I want to put them on a garage door. Does the color come off of these wall clings? 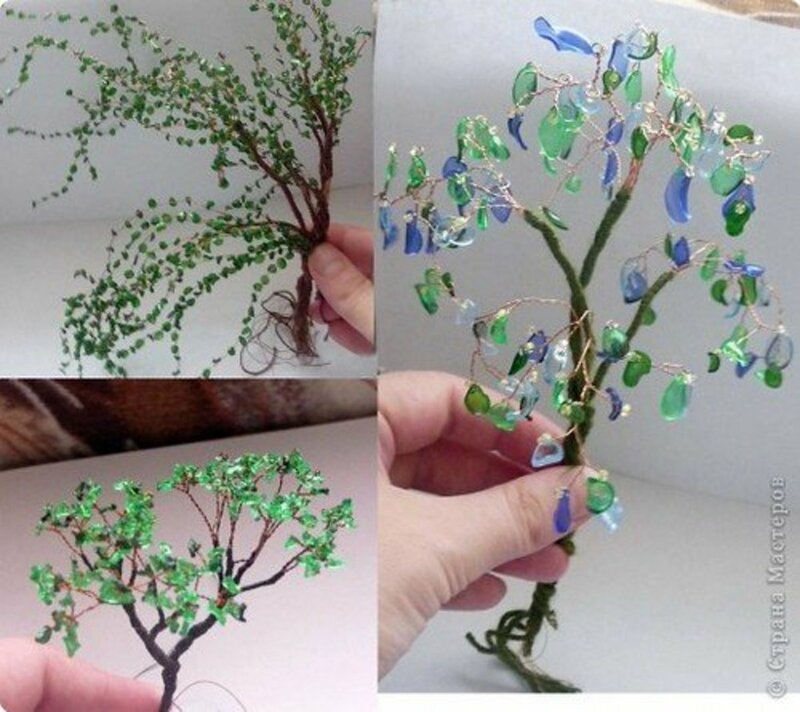 They are not gel clings, just window clings made out of dried craft glue that stick on smooth surfaces indoors. Yes, the color will bleed (pun intended) if you use them out in the weather as they are not water resistant. How does the glue cling to windows and how long would this whole project take? The glue clings to the window by being really smooth and very slightly tacky on the back. The whole project takes a variable amount of time because water-based glues' dry times are affected by humidity. In a really dry house, you could complete them in less than a day. In a humid area or humid house, the first glue layer could take days to set. will try this, this coming halloween. thanks! The white base prevents the food coloring from transferring. If you use them only on glass, ceramic, slick plastic, or polished metal surfaces you can forgo the plain glue layer. Without it, they will definitely stain painted surfaces. Do you have to use the white base, or can you just use the red mixture? Yes, you can apply the glue without dipping your hands in it; it's just easier to make the hand shape using an actual hand. Could I just put the blood colored glue on without using their hands? @FatBoyThin My roommate and I sometimes use them just whenever to confuse our guests. @FlourishAnyway You're welcome. It's very messy but quite easy. @Jordan The clear base only needs to dry to the touch before the red layer is added. @Kristen Howe I'm pleased you enjoyed it. 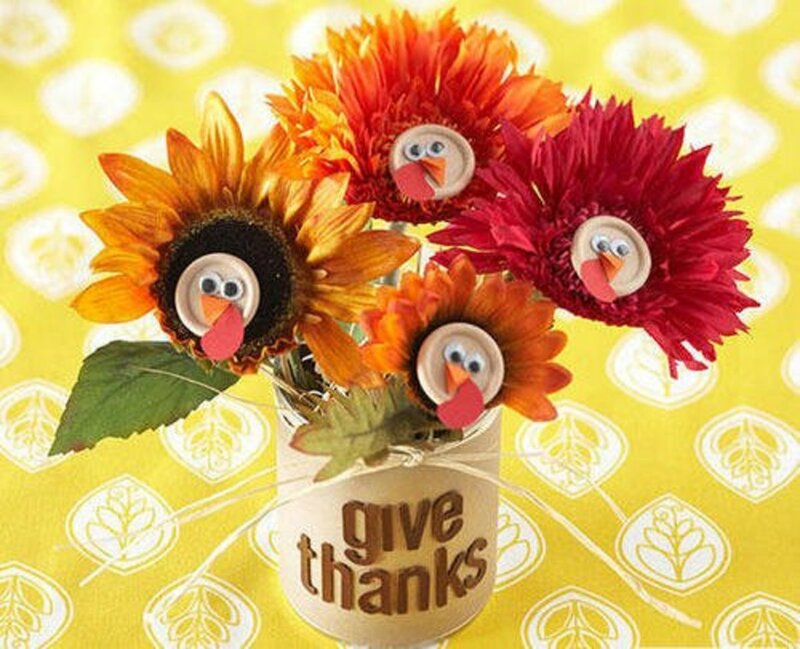 @DzyMsLizzy It's a great craft for kids. It doesn't have to turn out tidy to look good and they love making the "mess" on purpose. It's also inexpensive as heck. Congrats on HOTD!! What an interesting idea. This would be fun. I'm sharing this on FB and Pinning, so my daughter can see it--I think the grandkids would enjoy doing this. Congrats on HOTD, Kylyssa for this timely hub, since I've read it this month. Does the base need to dry completely translucent before adding the red layer of paint? Thanks for your time. This is my kind o fun! Thanks for these creative instructions! Ooh! Wonderfully gory, and what an easy way to turn your home into a crime scene. Cheers. It is easy to remove from glass and other slick surfaces. If they've been exposed to a lot of moisture when in use, you may need to use a spatula or scraper to remove the decorations. Then you can finish cleanup with warm soapy water. Great idea, Kylissa! It's fun and not so creepy, either. Two bloody handprints up! If the plain layer of glue is thin, it's barely visible. But if you want a more realistic look and are not worried about getting a little dye transfer on the surface you'll be using, you can make a few without the plain base. The dye will come right off glass surfaces with a bit of glass cleaner. The comments are not threaded properly so you can't see that my comment was in response to that last one by an anonymous user asking to use it in a newsletter. I don't think they have any intention of plagiarizing, either, so I responded to them as I did to be sure they understood what I was willing to allow and what I wasn't. I really wish the reply function threaded comments to the comment they are written in response to! Linking is greatly appreciated. However, please do not cut and paste the text or images. Thank you! This is great! Is it alright if I use it in my company's October newsletter? With credit to you and a link to your blog of course. Very cool idea for decorating our Halloween windows! I have pinned it to my "Halloween Decor" board at https://www.pinterest.com/konagirl/halloween-decor... so i can find it again when the time is right. Try wiping the spot where they are to cling with a damp cloth or try breathing on it to create some condensation before reapplying. I've never had the problem, but I live in Michigan where it's humid. I made a couple clings to try it out. When I first took them off they stuck to the window. The next day I went to put them on again and they no longer stick. Am I doing something wrong? Or are they a one time use? Thank you for your help. Looks bloody indeed! A great suggestion and you certainly know what goes. This is so cool. I'm pinning this to my Halloween Décor board. It probably would not work or work as well. The Elmer's glue becomes translucent and stays a bit flexible. This particular homemade glue would definitely not be as translucent when it dried and, while the sugar might make it a little hygroscopic, I doubt it would hold enough moisture to keep the flexibility that allows the clings to work well. The glue's ingredients is flour, water, liquid starch, vinegar and sugar. What are the glue's ingredients? I'd suggest you try making a very tiny bit of it and see what the final consistency is like. Could this be made with homemade glue? If you put down the layer of plain glue without dye in it first, it shouldn't cause staining. It's the reason for that step. Hey! This is really cool. Does this stuff stain surfaces like the regular gel clings? I've noted that when sticking them on the tile they stained a bit before, but nothing a magic eraser couldn't fix. If you are referring to the translucent gel type, I don't know if it would work or not as I've never worked with no-run glue and I don't know what the finished consistency would be like. You could give it a try using the tiniest drop of color in a dab of it and then seeing what it's like when dry. is elmers no run school glue okay? When the glue has become mostly translucent rather than mostly white on most of the print, the glue should be dry enough to start applying the layer or layers of color. Love this idea! I will have to try to make these this year. Great tutorial and awesome instructions. I have no idea. Anything that would change the texture of the dried glue might interfere with its ability to stick to slick surfaces. The only way to find out is to try it. You could mix up a tiny bit and see how it works out. Do you think you could use washable craft paint instead of food coloring? It depends a lot on the humidity and temperature of the room where you are using them. I left a small one on my bathroom mirror for a few months. If they get dry and start to fall off, you can refresh them by peeling them off, putting them on plastic wrap or waxed paper, and letting them sit in the bathroom while you take a steamy shower. How long do they stick to stuff for? Like if I made them at the beginning of october, would they still be sticking to my window by Halloween? Once the liquid evaporates from the glue the clings don't seem prone to melting. If anything, they tend to get brittle over time. I haven't stored them anywhere hot but I did have some on windows that got direct sunlight for a few weeks without any melting. I'm not 100% sure storing them somewhere it gets over 80 or so consistently wouldn't degrade them or melt them but it seems unlikely. If they did melt and stick to the wax paper, you could probably pop them into a refrigerator for a few minutes and get them loose. just curious. When you put it between the wax paper and store it, In the summer if it is to hot, would the glue melt? You can often remove dye from your hands with vegetable/canola oil. I haven't tried it with the red food coloring, but it would be worth checking it out. What fun! 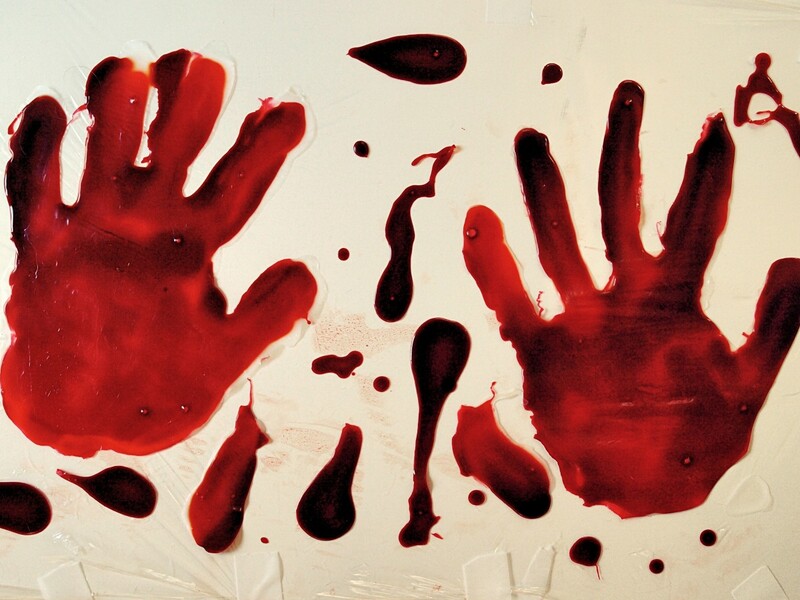 I like the idea of bloody Halloween hand prints. Thanks for great instructions on how to make the handprint clings! What a great idea! I've seen someone use these for their Halloween decorations! It looked great! Perfect, definitely going to be doing this, but making our own pattern of a pentagram. Hey there! 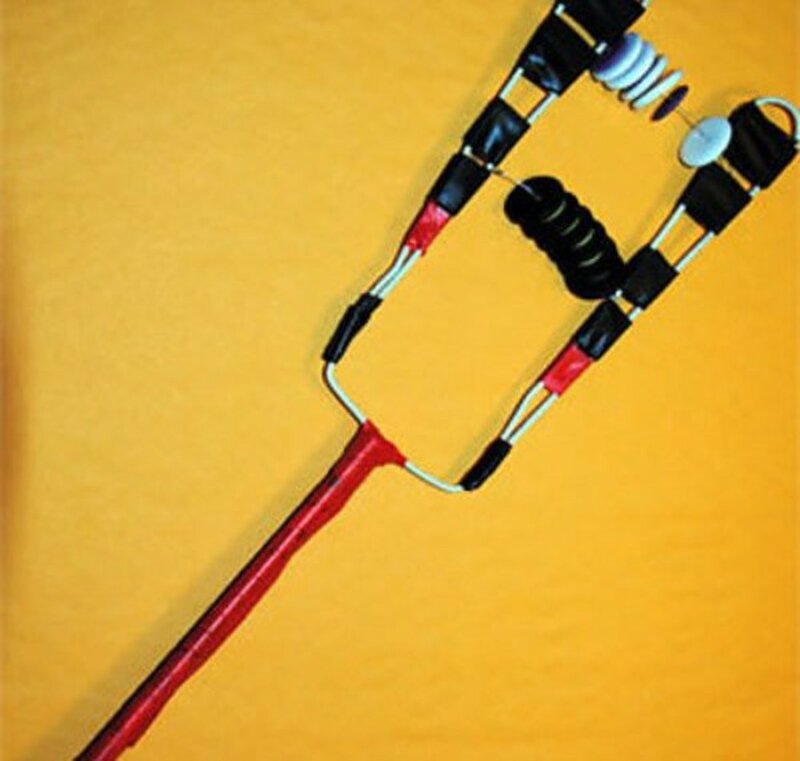 This is a bloody good DIY - I bet I could really scare my neighbors! OK, I love this and will be making it before we go camping this weekend at our 10th annual Spooktacular in Tucson. We always decorate our vintage trailers for Halloween and this is a really great idea. You have made it look easy. Blessed! I'm definitely going to try this with my son. He'll love this! I am sure boys would love to do that and maybe not so young boys! Don't think I would want that on my windows, but a brilliant idea for those of the morbid nature. ugh... very realistic looking. I'll feature this on my 101 Ideas for Haunted Houses. Fascinating idea and so creative . Fun idea. Thanks for sharing! Have a Happy Halloween. @Kylyssa: Thank you so much for your thorough &amp; prompt response! I'm off to try a batch &amp; I'll be sure &amp; let you know if we end up using it for my party. Have a lovely day! @anonymous: In normal conditions, you can put the blood glue layer on after about forty-five minutes to an hour. It takes less time if it's dry where you are working and can take a long time if humidity is high. The ones I made to take the photos were ready to put on the windows in less than two hours from the time I first touched glue to plastic wrap. The thickness is needed to create a thicker, stronger, and less brittle finished product. 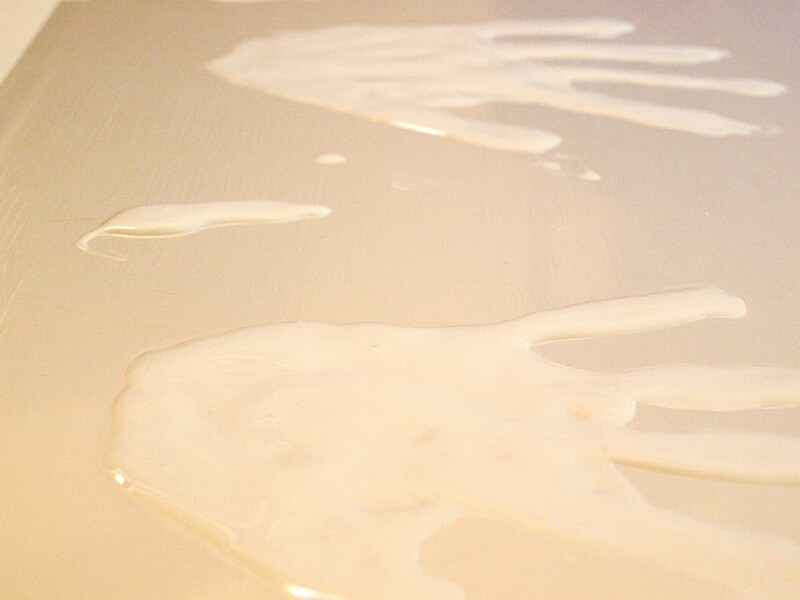 Using multiple layers of glue to achieve that thickness speeds up the drying time immensely. A single very thick layer could take as long as a day to dry. It may also spread out and blur the hand shape way more than you'd like, especially since your bloody glue will be a little thinner and take a little longer to dry than plain glue. Using plain glue for the base makes it so you don't have to make up as much blood colored glue. 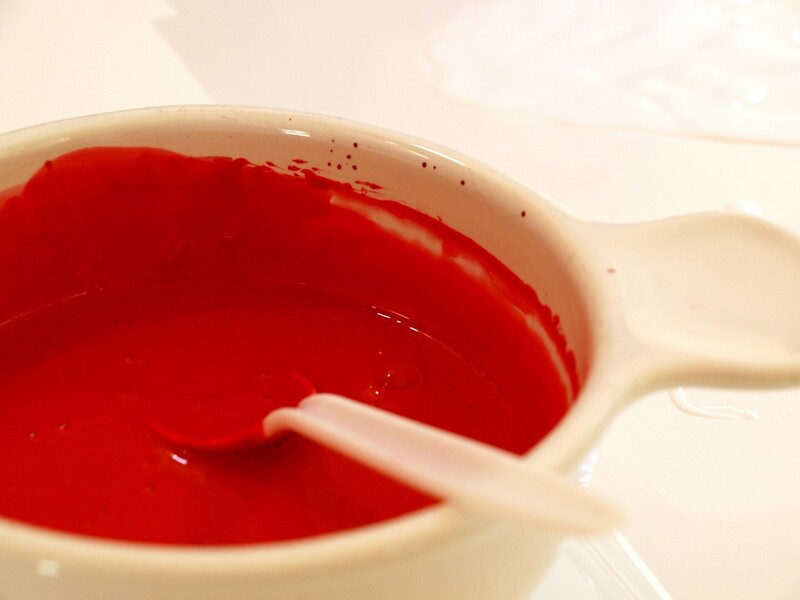 It also reduces the incidence of transferring red food dye to surfaces and reduces the chances of dripping blood colored glue where you don't want it simply because you handle less blood glue that way. I've found the clear layer gives the finished product a nice translucency that compensates for the thickness required to make the hand prints sturdy. I love this idea so much! I'm thinking about having a table set up for making these at my 5th annual pumpkin carving party. 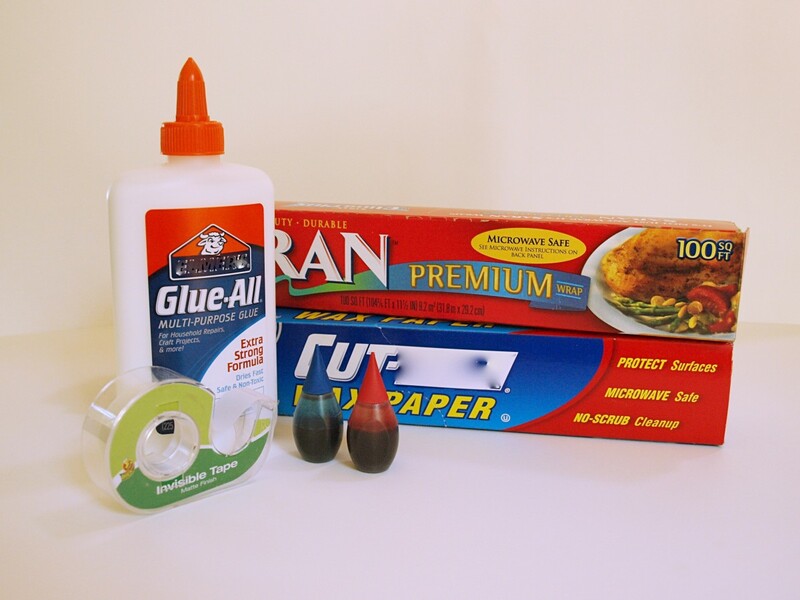 Could you answer a few quick questions?About how long do you need to wait in between the plain glue &amp; the red glue? About how long does it take overall? What is the reason for the 2 step process? @anonymous: As long as you don't have carpeting or wood floors there's no reason you couldn't. I just happen to have an apartment full of carpeting that stains like nobody's business but if I had linoleum I would put the fake blood glue directly on the windows. Very cool! Can you apply the glue directly to the window, and then later when you're finished using it, scrape or peel it off? I added your Bloody Handprint directions lens as a link from my decorating Bloody Glasses lens. fantastic! you can make cobwebs in a similar fashion - they're a bit fiddly with the webbing but the PVA glue on plastic technique is the same! Good idea! I want to try this with other shapes for other holidays like Valentine's Day. 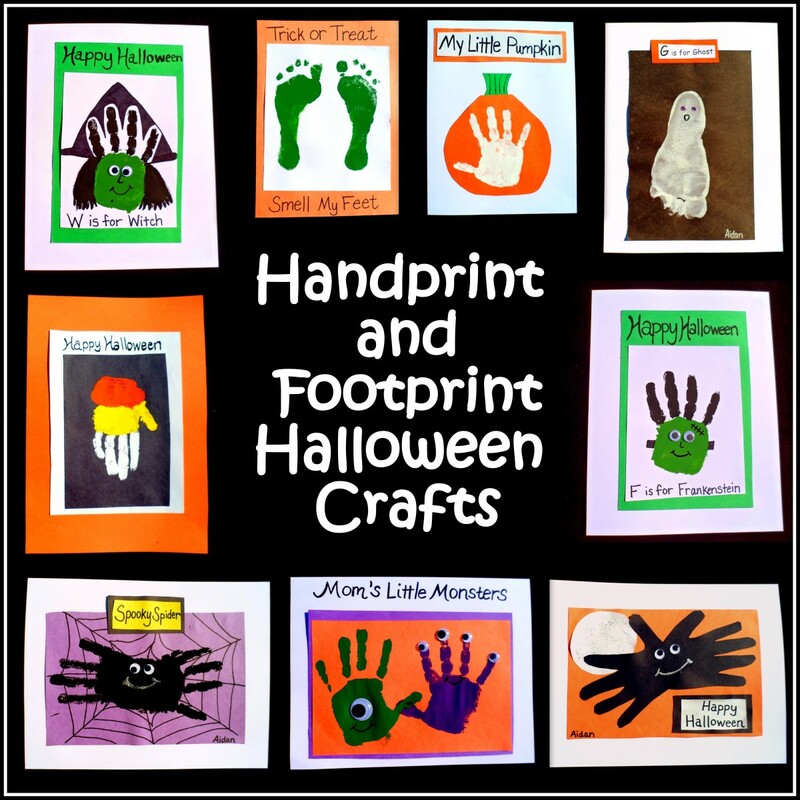 Very cool Halloween craft! Congratulations on being featured on Squidoo's Happy Halloween magazine! Pretty creepy--I love it! Angel blessings. I have to try these! How clever. @BarbaraCasey: They stick to any smooth surface. Do the hand prints stick on the glass all by themselves? I've never used window clings before. Really fun lens. @kburns421 lm: I'd be delighted to have any of my Squidoo lenses pinned. Thank you! Actually, do you mind if people pin your stuff? (I know some people don't like it.) I think you could bring in more traffic through Pinterest, and I'd gladly pin it. This is so cool! I've used window clings and window gels, but I didn't know it was so simple to make my own. I mean, clearly it takes some work and is messy, but I didn't even know it was possible. Yours came out awesome, by the way. This is nothing short of an awesome craft/decoration! 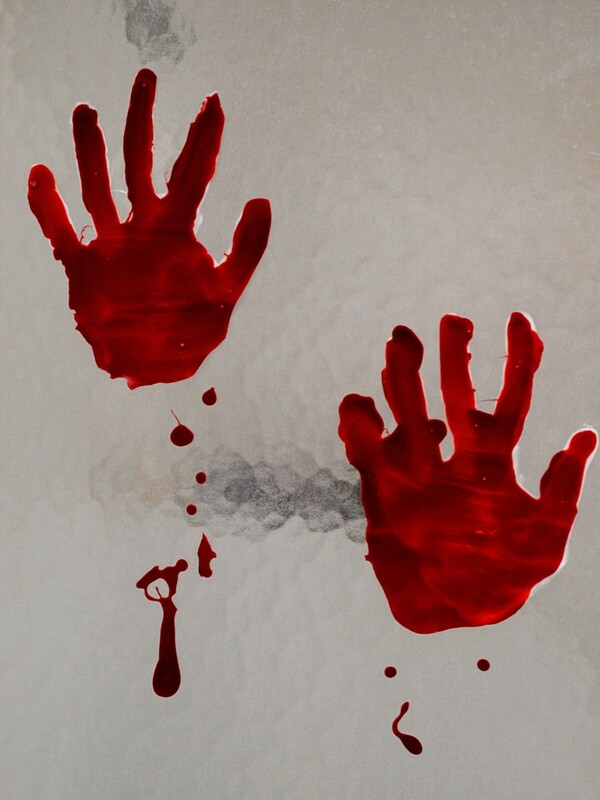 My windows will be sporting a few bloody handprints this Halloween, for sure.